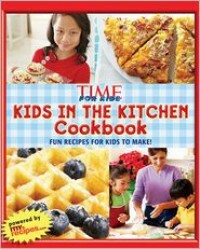 TIME for Kids Kids in the Kitchen Cookbook: Fun Recipes For Kids To Make! The first thing that drew me to this cookbook is its sturdy construction and wire bound pages. Then once my kids came home from school I didn't get much of a chance to look at it since they wanted it. Which is always a good sign! This cookbook is kid approved. Each page has difficulty of the recipe, fun food facts, little known facts from Time magazine and the basic nutritional information, ingredients, serving size etc. The photos are sharp and take up much of the page since children are very visual. My kiddos loved the "Here Comes Simon the Centipede" oreo dessert and poppy seed muffins best. Mom's favorite is the after school snack section with easy to make and quick snacks for the family. My only wish is that there would have been a few more "just for fun" recipes instead of so many "more grown up" recipes. Make some designs out of fruit, give us bento box ideas. Thanks so much to Goodman Media for the book and for offering a giveaway!